Happy belated Thanksgiving to all of our lovely American friends (especially my lovely Texan friend Tim, his beautiful wife Katie and their GORGEOUS baby daughter Livy!) – Baby’s first Thanksgiving! We started our advent calendars this week – when you start a day with chocolate it really is downhill from there….it seems only right to add a little more chocolate in to the mix! Hands up – this isn’t one of my recipes! In fact, this particular recipe has been doing the rounds very recently! Its super easy, just takes a little time as the dough needs to prove. The original recipe can be found here. 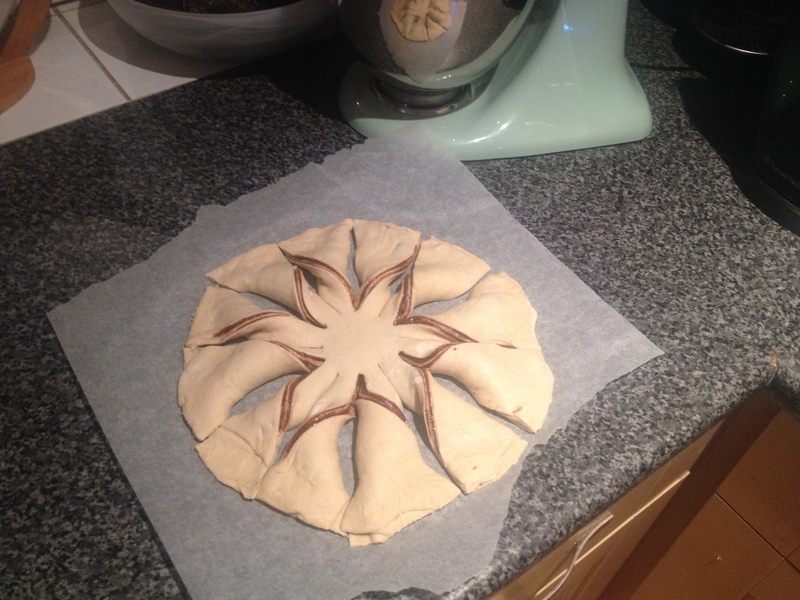 Dont be disheartened if this doesn’t turn out quite right the first time round…its so yummy an simple it will still taste great! Mine tends to have quite a chewy texture which I love but if your not so keen then you could try adding a little more yeast in to the recipe to encourage the bread to rise more. It’s also worth noting the dough will prove more successfully if it is left somewhere warm. Anyway, thats enough of that – Have fun making and baking! 1. Preheat your oven to 180c and connect the dough hook attachment to your stand mixer. 2. Add the flour, salt, sugar and yeast to your stand mixer and turn to a low setting, just to mix the ingredients together. 3. Next, slowly add the water to the ingredients whilst the mixer is still on a low setting. Once all the water has been added turn the mixer up to a medium high setting and leave to mix for around 15mins. Tip: This is quite a wet dough – if you feel it needs to be kneaded a little more then add a little more flour to the dough and keep your mixer on a little longer. 4. Whilst the dough is mixing, get another bowl and lightly oil it with vegetable oil. 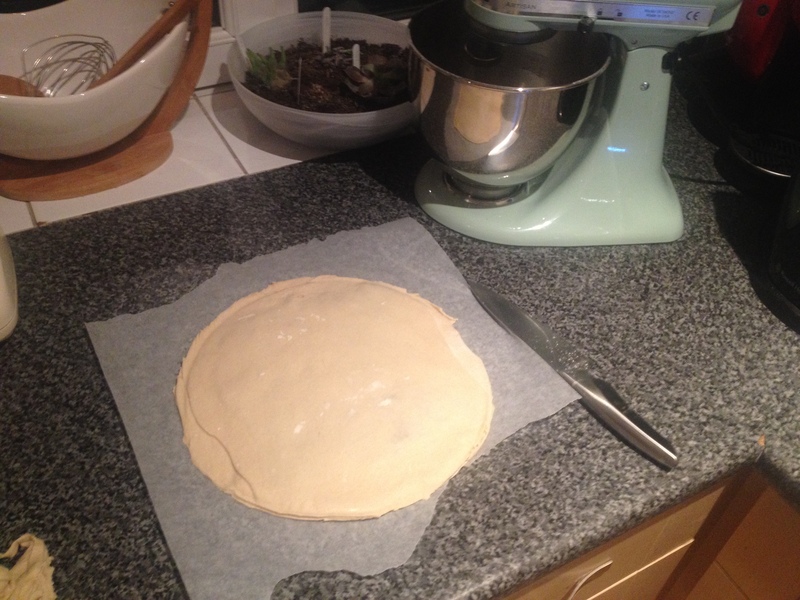 Place the dough you recently made in the bowl and cover it with cling film. Leave it in a warm place for about an hour and your dough should double in size. 5. After an hour you can remove your dough from the oil bowl and place it on a surface dusted with flour. Tip: Because this is quite a wet dough, feel free to incorporate a little more flour in to the dough as you knead it. 6. Cut the dough in to 3 equal amounts. 7. 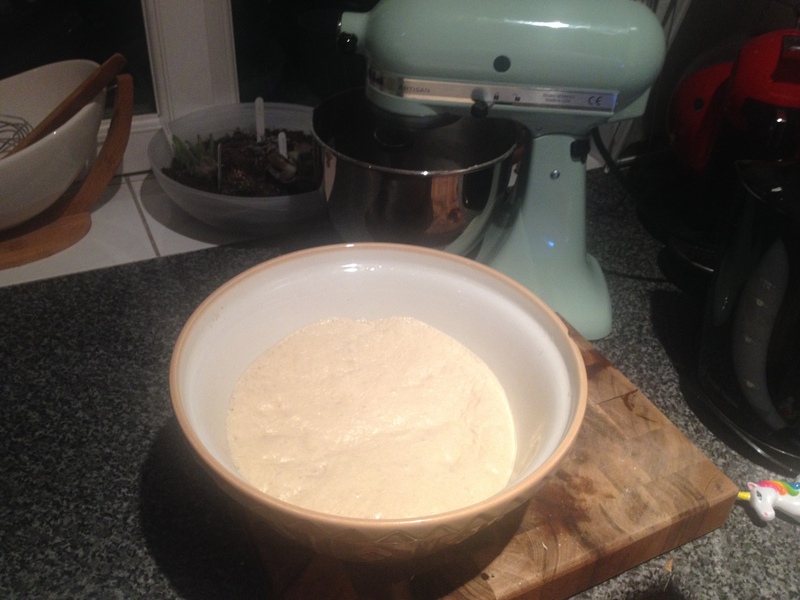 Roll each of the 3 dough balls in to 3 separate circles – roughly the same size. 8. 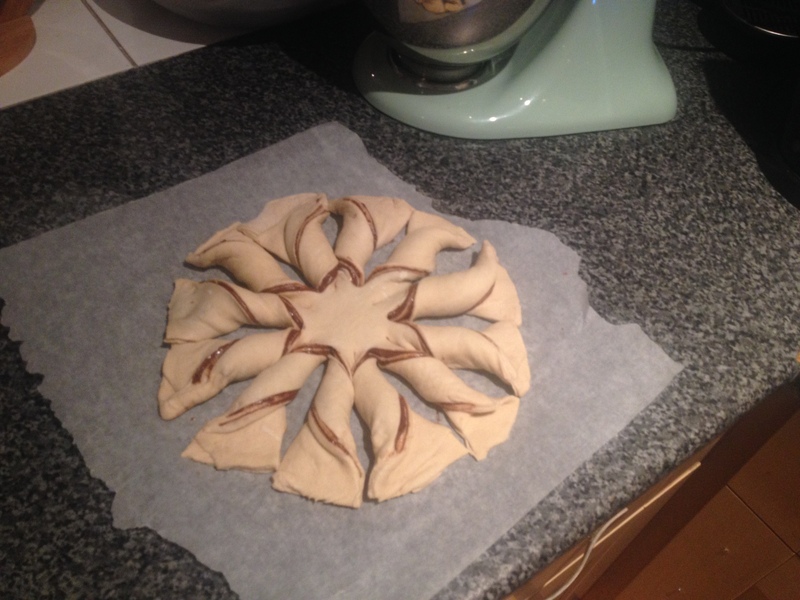 Take the Nutella and with a pallet knife or the back of a spoon, spread an even layer on the surface of the first circle of dough. 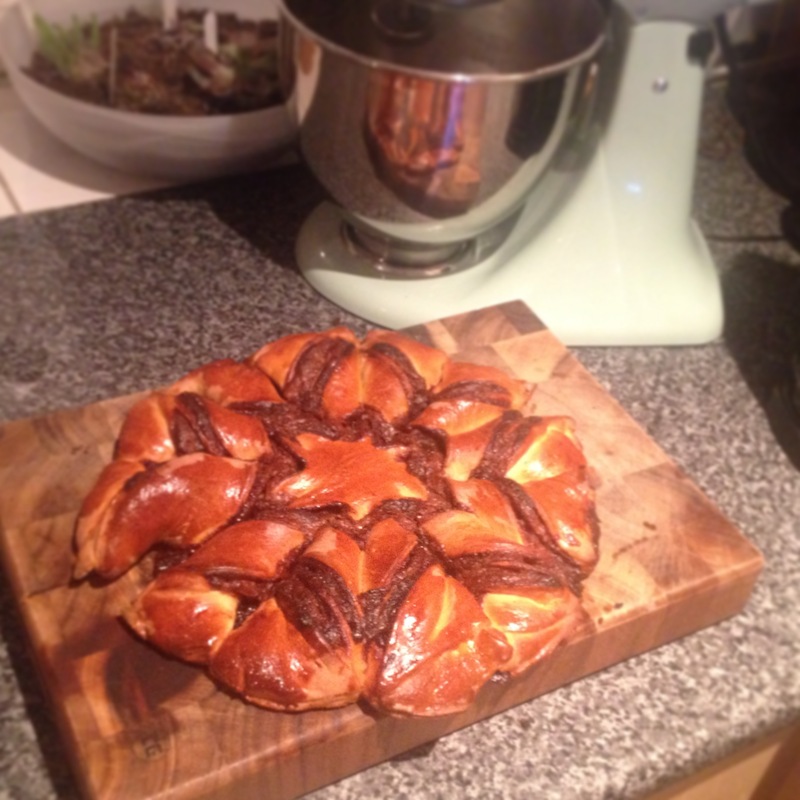 Tip: Ensure you leave about half an inch of Nutella free dough around the edge of the circle. 9. Repeat the above step with the remaining two circles of dough. 10. 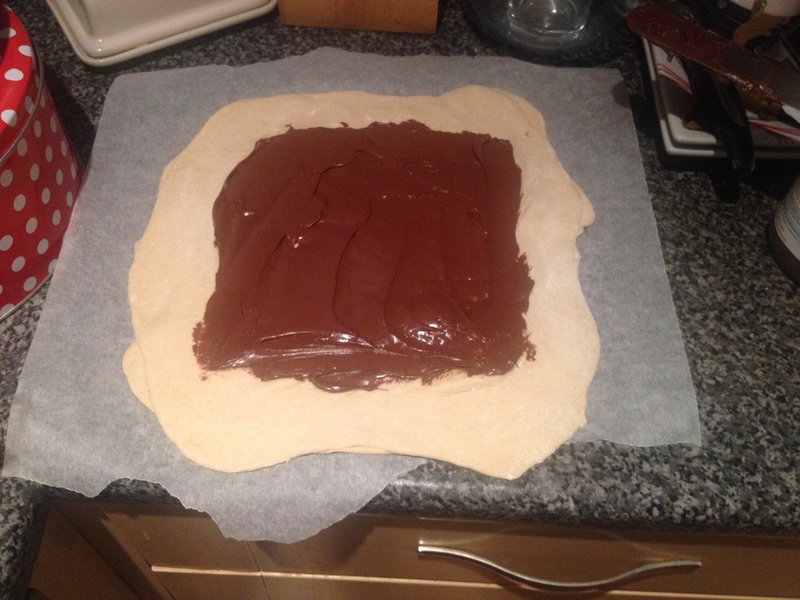 Place the ‘Nutella pizza’ on a baking tray lined with grease proof paper. 11. 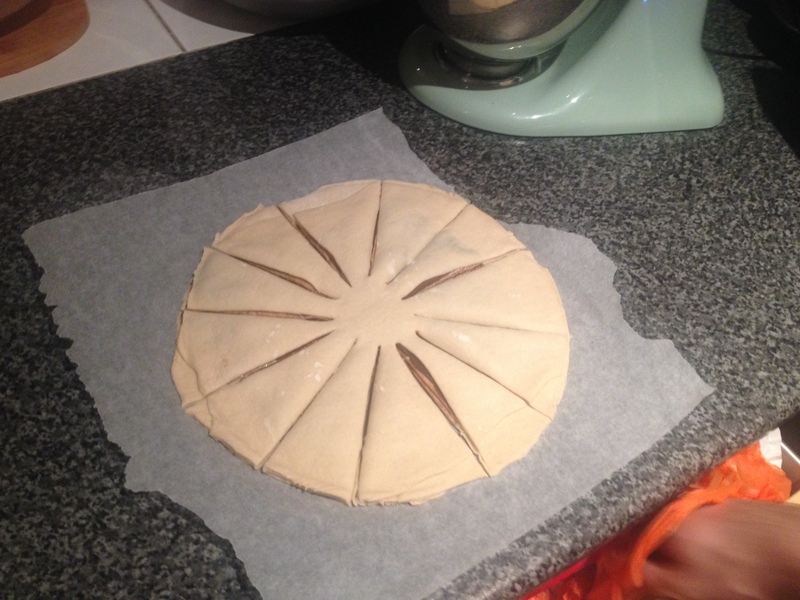 Use a sharp knife to cut ‘slits’ in the dough – make sure that you don’t cut right to the middle of the circle. Please see pictures for guidance. 12. For every cut you made, twist the ends round in to a spiral shape. See pictures for guidance. 13. 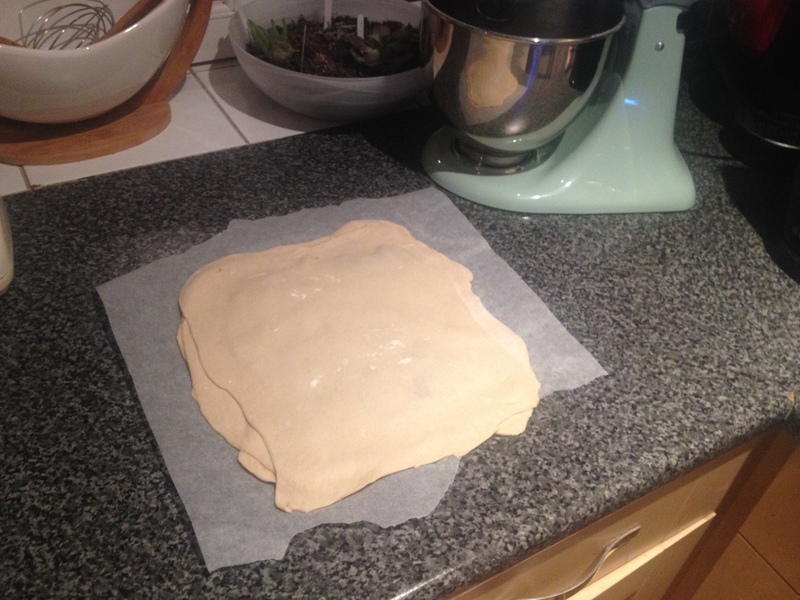 Once you have twisted your dough, cover it with cling film and leave it for a further 20 minutes. 14. After 20 mins – brush your dough with the egg wash and place in the over at 180c for 20 mins. 15. After 20 mins – raise the temperature of the oven up to 220c for a further 5 minutes. 16. Your bread is done! 🙂 Leave on the baking try to cool and then dig in!